I had the privilege of conducting a rare one-on-one interview recently with Paul Ryan of DIY Network’s Kitchen Renovations, Weekend Handyman, and Home Energy Savings shows. Paul was also a guest host on DIY’s 2007 Blog Cabin series where he installed all of the custom kitchen cabinetry for the blogger-designed log cabin located in Kinzel Springs, Tennessee. Paul is a licensed contractor and expert carpenter with experience in plumbing, fiberglass repair and general construction, but his specialty is kitchen renovations and remodels. I feel fortunate to have been able to speak with Paul to get his expert opinion on some homebuilding hot topics and kitchen trends. I’ll be shedding some light on the details of my lengthy interview with Paul in several upcoming posts on this website. In this first segment of our interview, Paul offers his opinion about the #1 thing you can do to the kitchen to increase the value of your home along with some options for refacing kitchen cabinets. Randy: What is the #1 thing any homeowner can do to a kitchen to increase the value of a home? Paul: Boy, I tell ya…you’re starting off with a toughie. I talk to people all the time about re-doing their kitchens and it’s like, “Do you do the whole thing or do you do just a little bit? Is there one thing that can add more value?” And a lot of times there’s not just one answer — because of the fact that there’s not just one thing. When you walk into a kitchen, you’re staring at the whole encompassing deal and sometimes when people do just one thing — it can kind of backfire on them. Paul: Let’s say somebody spends a lot of money putting in brand new appliances. That might be great, but it doesn’t do a lot for the overall look of the kitchen. Randy: What about re-facing cabinets… something like that? Paul: Sure. That’s certainly one thing you can do. Something as simple as changing the color can make a huge difference if you’re selling your house. Because you might have just one thing in there and if you simply change the color and make it match the rest of the decor, that’s something that can make a huge difference. You know, it might not be the #1 thing, but it can be an effective thing. As far as re-facing the cabinets, yeah…that’s one way that you can get a totally new look and it’s very, very inexpensive — well in some instances it’s inexpensive. We did one where they put stainless steel doors on, and each stainless steel door ran about $80. 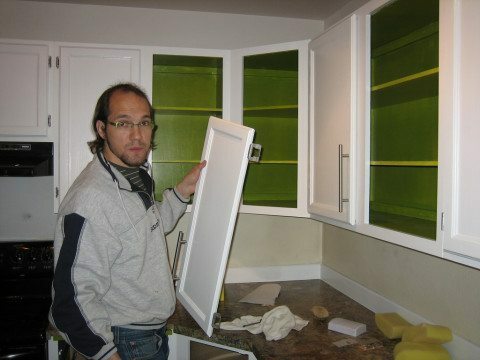 Paul: We’ve done some where we’ve re-faced the cabinet with some Formica and it was about $4 per door. So you can definitely get a whole different look that way without putting a lot of money into it. And yeah, that’s one of the ways that you can definitely improve the look of it. But when you talk about the #1 way, I’m always hesitant to say “the #1 way” — because there are so many different things that you can do that can totally change the look of a kitchen. Randy: And there are so many different situations, too. Paul: Yeah, definitely. A lot of it is budget driven. A lot of it is design driven. Thanks to… Lynnette of The Fun Times Guide To Log Homes (and other fun blogs) for getting the ball rolling for me on the interview. Amie K. at 360i for pointing me in the right direction to get the interview. Rob L. at DIY Network for setting up the interview for me with Paul. And, of course, Paul Ryan.